A lot has happened in Dresden during the 20 years since the German reunification. The city is almost unrecognisable. Indivi­dual buildings, numero us squares, and en­­tire streets have changed, and the build­­­­­ing projects are far from over. The Dres­­den Royal Palace remains the largest cul­­tural construction site in the Free State of Saxony. For decades, monument preser­va­­tionists, architects, craftsmen, build­ers, restorers, and art historians, all at the top of their disciplines, have achie­­ved great things. The Royal Palace has always been a lively place in the heart of Dresden, which, for the first time since the opening of the glass-domed small courtyard in January 2009, offers its visit­­­­­ors a foyer. 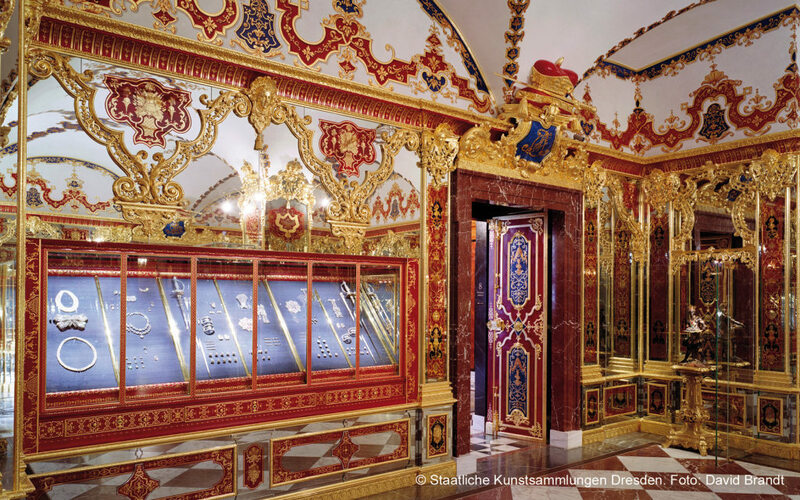 Besides the Green Vault, which contains the largest collection of treasures in Europe, and the Collection of Prints, Drawings and Pho­­to­­graphs, which is one of the key art mu­­seums in the world, the Royal Palace now also houses the Turk­­ish Chamber. The latter is counted among the world’s oldest and most signi­­ficant collections of Otto­man art out­­side of Tur­­key and documents the history of a passion that reached its pinnacle under Augustus the Strong. How­­ever, that is not all. The Princely Gal­­lery is an elegant hall that is lined with ruler portraits, is available for presentations and other events, con­­nects the west and east wings, and whose view onto the unfinished large courtyard and opposite fa­­cades gives it away that the coming years are bringing more change to the Royal Palace. The Dresden Zwinger palace is di­­­­rectly ad­­­­­ja­­­­­cent to the Royal Pal­­ace. Orig­­inally planned to be an or­­angery, it now­­a­­days houses four of the most di­­verse museums of the Dres­­­den State Art Col­­lections. The Porc­­elain Col­lec­­­tion is both the largest and highest quality special col­­lection of ceramics in the world, not least thanks to its outstanding inventory of early Meis­sen por­­celain as well as the East Asian porcelain of the 17th and the early 18th centuries. 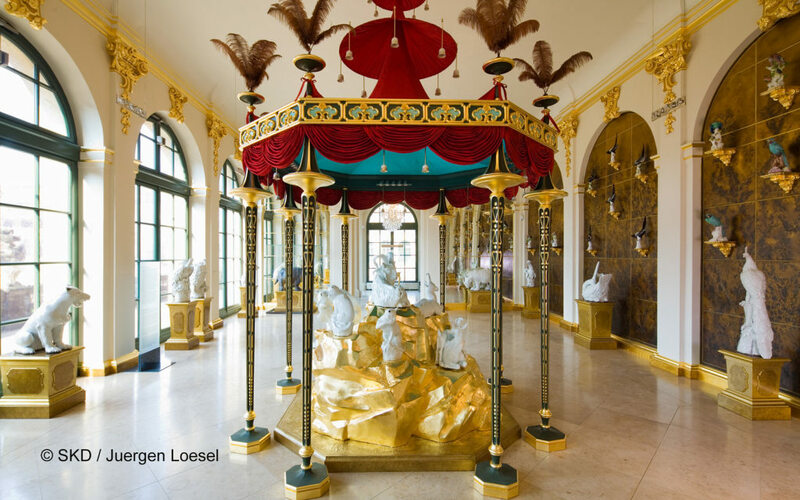 The internationally re­­nowned New York desi­gner Peter Marino refa­­shioned both Curved Galleries and the Animal Hall, part­­­ly following his own fantasy and partly re-interpreting the historical 1735 concept of the Japanese Palace by architect Zach­­arias Longuelune. The Royal Cabinet of Mathematical and Physical Instruments houses a world-famous collection of historical clocks and scientific instruments. 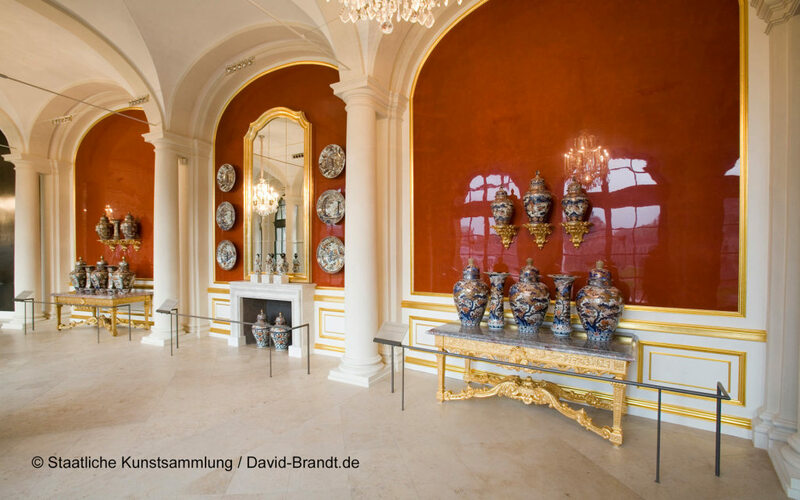 After years of renovation, it will offer a better and bigger display of its treasures in the Zwinger starting Easter 2013. They include Earth and celestial globes, fascinating optical, astronomical and geodetic instruments reaching back to the 16th cen­­tury, as well as historical devices for cal­­cu­­lating and drawing, in addition to meas­­­­­uring length, weight, temperature and air pressure. The Ar­­moury, originating from possessions of Saxon dukes and elec­­­tor­­ates, is nowadays counted among the world’s most precious collections of cere­­monial weapons and garments. In a few years, it is to move to the Royal Palace and reopen in a space over 6,500 square metres. The Collection of Antique Sculptures from the Sculpture Collection in the east wing of the Semper Building will be shown in its place, thus returning to its historic location. The Old Masters Picture Gallery right across is perhaps Dresden’s most renowned museum. It owes its world­­wide fame to an outstanding selec­­tion of distinguished masterpieces. The Sistine Madonna by Raphael, with its 500 years of history, is perhaps the most famous one. 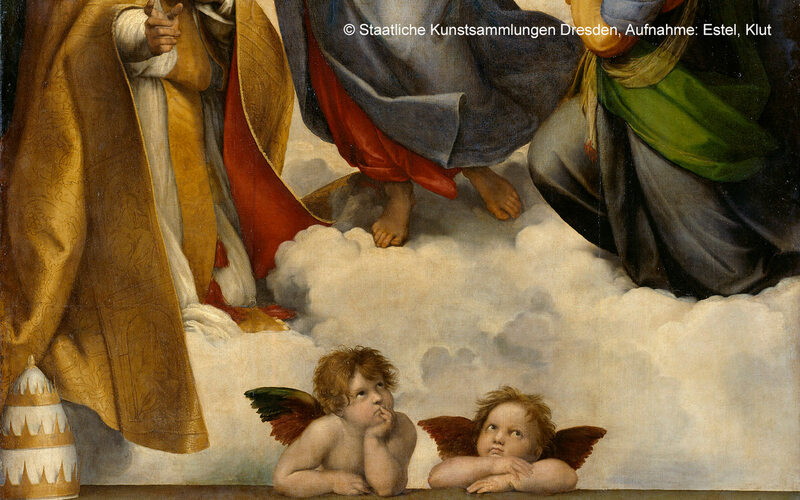 The two “lounging” cherubs at the bottom of the painting, by the way, have been used in advertisements through­­out the world for almost 200 years. Hovering over the inner courtyard of the Albertinum, home to the New Masters Gal­­lery and the Sculpture Collection of the Dresden State Art Collections, stands a contemporary masterpiece of architecture: the flood-proof warehouse and workshop building. The Albertinum, which was trans­­formed and entirely renovated during that construction project, is a place where art from the Romantic to the contemporary periods is experienced in a wonderful way. In addition, the art gallery in the Lipsius Building on Brühl’s Terrace is mostly dedi­­cated to special exhibitions of contempo­­rary art, such as Sigmar Polke, Jeff Wall, Eberhard Havekost, Gerhard Richter, but also internationally less re­­nowned contem­­porary artists. Besides the Kunsthalle art museum in the Lipsius Building, the Dresden State Art Col­­lections have also long been utilising the yet unrenovated rooms on the third floor of the Royal Palace (the former parade halls of Augustus the Strong) as a location for large-scale non-modernist special exhibi­­tions. Outstanding projects are exhibited here, such as “Crossing the Sea with For­­tu­­na: Saxony and Denmark – Marriages and Alliances Mirrored in Art, 1548-1709”, repre­­sentying centuries of close relations bet­­w­­­­een the Electorate of Saxony and the pow­erful Kingdom of Denmark. This was also the location of the exhibition “State of the Art since 1560”, held in celebration of the 450th anniversary of the Dresden State Art Collections, as well as “Crossroads of world cultures: Art from the Kremlin from Ivan the Terrible to Peter the Great”, resulting from the successful international cooperation between the Green Vault and museums of the Kremlin. In 1560, the Saxon Elector Augustus the Strong had founded the Art Chamber and laid the foundation for the grand collections that between twelve museums to­­day re­­p­­re­­sent the second largest associ­­ation of museums. 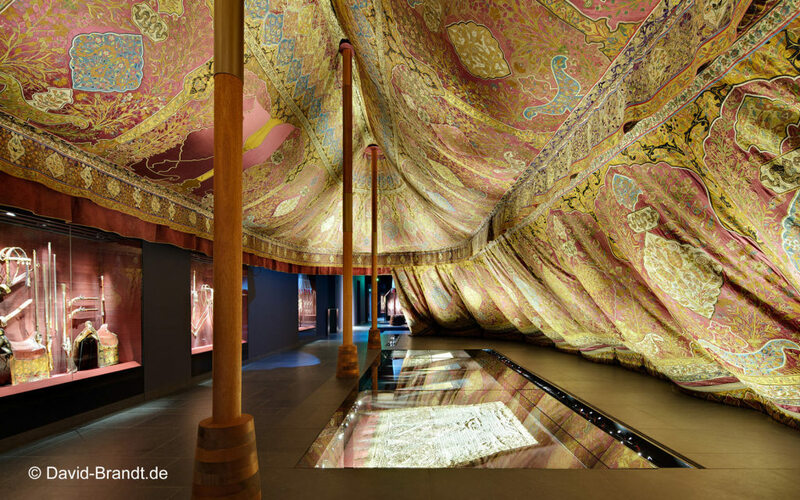 there are also the Museum of Decorative Arts in the Pillnitz Castle, the Museum of Saxon Folk Art and Puppet Theatre Col­­lec­­­tion in the Jägerhof hunting lodge, the Coin Cabinet with future presentation in the Roy­­al Palace and, last but not least, the Saxon Ethnographical Museums in Dresden, Leip­­zig and Herrnhut. They all contribute to the unique cultural diversity of Dresden and Saxony. Thanks to the reconstruction of key cultural buildings such as the Semper Opera House, Zwinger and Dresden Royal Pal­­ace after the wartime destruction, this city has kept what is being reinvented elsewhere: as opposed to “artificial” cultural quarters of the past 15 to 20 years, significant cultural institutions have taken their place here for centuries, setting es­­sen­­­tial standards over long periods of time in positioning and mediating art and culture. Nowadays, those museums stand on par with the world’s most famous museums in terms of not only their artworks but al­­­so their technical features and presentation. To that effect, the staff of the Dres­­den State Art Collections perform funda­­men­­tal con­­cep­­tual and restorative tasks as well as im­­pose the highest standards of qualified and continuous scientific mon­­­i­­toring of the collections. That includes knowing the prov­­e­­nance of each artwork and entering it into the museum database Daphne, which, as part of a ten-year prov­­enance research and documentation pro­­ject that is ground-break­­ing and unique in Europe, is setting new stand­ards com­­ing from the Dresden museums. More than 20 years after the political turn of events, the Dresden State Art Collec­­tions are a unique place of encounter, which enjoys the highest international renown. In the summer of 2009, US President Barack Obama chose Dresden among a handful of European des­­ti­­­­nations and met with Chancellor Angela Merkel in the Roy­­al Palace. They retreated to the Green Vault for consultations, and the subsequent press conference was held in the small courtyard. The buildings of the Dres­­den State Art Collections offer a stylish set­­ting for events, and some are also rented for conferences, concerts, readings, seminars, lectures, receptions and various festivities. Since the foundation of the Art Chamber more than 450 years ago, the future of the institution has been a work in progress. In that process, many more small and big steps are going to help make the collections fit for the future. 450 years after the foun­­dation of the Art Chamber, all forces are necessary inside and outside the Art Col­­lections in order to preserve the cultural heritage for the future. We look forward to your visit to Dresden! The author studied art history, Egyp­tol­­­ogy, and classical archaeology. After obtaining his doctorate, he worked as a scientific assistant at Kunsthalle Biele­feld and later as deputy head of the historical museum of Bielefeld. In 1993, he assumed management of the Green Vault. Since 2011, Prof. Syndram has been provisional administrator of the Dresden State Art Collections.